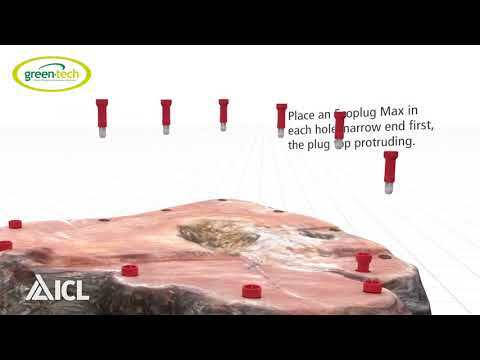 Ecoplug Max Tree Stump Killer is a patented tree stump control application. Each plug contains 300mg of granular glyphosate which is released inside the tree stump ensuring all of the active ingredient is carefully targeted where it is needed. The glyphosate is translocated through the stump and down to the roots preventing new growth and leaving the stump to gradually rot away. Requires 13mm drill bit. Step 1: Cut the tree as close to the ground as possible. Step 2: Drill 25-30mm deep & 13mm wide using the Ecoplug drill bit to control the depth (the Ecoplug drill bit has a stop plate at 30mm allowing precise depth control). Step 3: Place an Ecoplug in the hole with the orange end first. The top will protrude by about 10mm. Step 4: Hit the Ecoplug with a hammer until the head is flush with the stump to push out the sides & release herbicide. Blue Ecoplugs are available for exclusive use on Network Rail contracts. As of 31st December 2017 Blue Ecoplugs will be replaced with Purple Ecoplugs. Blue Ecoplugs can still be used on Network Rail contracts until 31st December 2018. Contact a sales advisor today to discuss. How to Apply Ecoplug Max Tree Stump Killer​ ​Step 1: Cut the tree as close to the ground as possible. Step 2: Drill 25-30mm deep & 13mm wide using the Ecoplug drill bit to control the depth (the Ecoplug drill bit has a stop plate at 30mm allowing precise depth control). Step 3: Place an Ecoplug in the hole with the orange end first. The top will protrude by about 10mm. Step 4: Hit the Ecoplug with a hammer until the head is flush with the stump to push out the sides & release herbicide.